Get rid of pests for good with this electronic pest repellant that plugs into your wall! 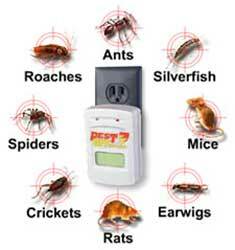 Pest Offense’s powerful force-field drives pests away from where they live and breed - in your walls! Easy and safe to use. Comes with a built-in surge protector and night light. One unit covers up to 2,500 sq. ft. Stop throwing your money away on bug sprays! Pest Offense is not recommended if you have pet rodents, gerbils, guinea pigs, chinchillas, minks, or tarantulas.